A view of Melbourne from the south shore of the Yarra River. Rowers are a social breed; they’re happy to row but most are even happier to grab a coffee afterwards, or sit in the fading light and enjoy a beer, or plan a weekend outing far from the boathouse. Friendships form quickly; people who never would have looked twice at one another on the street now have a shared, private experience. It may be the early light of a glorious sunrise as you drift along the shore, or a game of cat and mouse with a river barge, or a boatloading that throws you together rigging boats for a spell. Rowing abounds with casual interactions that reinforce your familiarity until one day you wake up and realize they’re your friends, and you don’t know quite when it happened, but it has. Based on chance comments in conversation and postings on Facebook, it’s clear that rowers often plan meals together, go to one another’s family celebrations, even crash one another’s vacations. I’m still amazed by all this closeness. When I returned to rowing over 10 years ago, I had two small children and no intention of getting bogged down by either club politics or club relationships. I always arrived on time at the Minneapolis club, but said little, rowed whatever position I was assigned, and as soon as the boat was dried off and put back on the rack, I’d grab my keys and run up the hill without a glance back. I was busy, I had a family, and I didn’t dare stop to talk. I think I knew, somehow, that if I stopped to talk and learn names, I’d get drawn in. Such a step would allow rowing to take an even larger bite out of my time. And my family would not be pleased. They already disliked my several-hour disappearances as it was. Yesterday morning I rowed with the captain of the women’s rowing team at Melbourne Rowing Club. She’s a member of the Victoria state master’s rowing team, which is a system that doesn’t seem to exist in the US. It’s not the national team, but the next step down. It’s a serious commitment with many regattas and intense trainings. Yesterday when she met me mid-morning, she’d had three races the day before and had rowed with her team earlier that morning. Then she’d taken her two kids in for their first day of school, leaving her youngest with a hug and encouragement to keep his chin up. She came straight to the boathouse from this family milestone. It was her first day in years without at least one child at home, and she was giving half of it to me. Bless this woman. We’d rowed together once before, a year ago, when I’d had the chance to come to Melbourne initially. 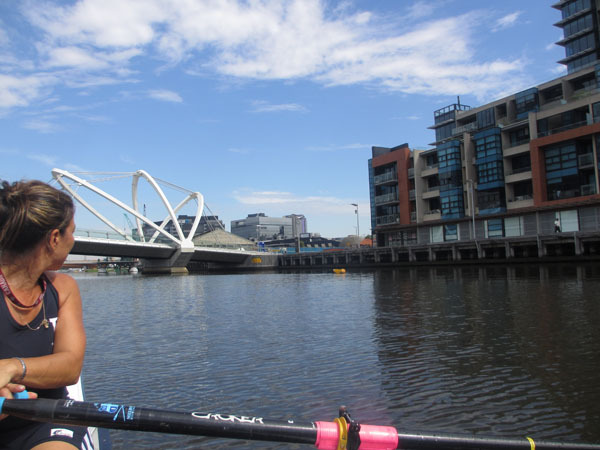 She led us on the scenic route through the city, not the direction the team would normally row—they prefer the calmer waters in the other direction. I asked if we could do that again; it’s the best view of one of the world’s most beautiful cities, and I figure locals like having the chance to show it off. And it was indeed a treat, just as it had been last time. I asked her what it’s like to be captain, a role she’s filled for 10 years now. She gave me a glimpse of club politics, how she’s had to campaign in some years to defend her role, how she’s had to learn the art of diplomacy when she wants nothing more than to lash out at people who shout about club policy in all-caps via email. She asked me what it’s like to row in German without knowing the language, and what it was like to learn the commands. She asked how I found a club and first made contact, and I told her about the wonders of Google Translate. Sharing a double, rowing under a string of low bridges, enjoying the cool air, then emerging in the full-on sun that made my head feel like it might explode; staying out of the trash traps along the sides of the river, dodging the wake of ferry boats, we talked about motherhood, our youngest kids’ tantrums, how hard it is to stay calm when it’s happening. How we each feel no desire to have more kids, though we both have kids who ask for a baby brother or sister. How good it feels to row a decent race and know you gave it your all, even if you didn’t win. I suppose this is why I stick with rowing even through the listless winter months, so as to hold up my end of the bargain. Is there anything better than flying across the world and having the opportunity to step into a double with someone you barely know, and find yourself drawn into her circle simply because you showed up? Last evening she sent me an email; a group of rowers are going to meet up one evening at the Moonlight Cinema in the Botanic Gardens; would I like to join them for a picnic and a film? She got me with these words: “Bats flying above, night birds starting to chirp a lot and the vibe of the people sitting around chatting over a picnic waiting for the movie to begin…” If there’s one thing rowers do best, it’s to appreciate what’s all around them when they’re doing something they enjoy. I checked with Deb, who said she’ll be wiped out by then after a week of work. So I replied that yes, I’d join the group, and didn’t mention that I’d already seen the movie. That seemed beside the point. It’s the venue and the company that’s the draw. Jetlag has me still begging for sleep, so I crawled into bed before 9 p.m. last night. But sometime around midnight I awoke and was pinned flat by an unpleasant sensation. Guilt. Remorse. Was I blowing off my sister by accepting this invitation? We’ll be traveling together this weekend, it’s true, and we’re spending evenings together and will get a few daytime hours together on Thursday, but had I been unsufferably selfish by accepting this invitation when it meant I’d miss some of the few weekend hours with my sister, the one who brought me here? This is familiar terrain, my willingness to give over precious hours to rowers that could have been spent with those closest to me. Arguments for and against wove through my head until I finally succumbed, exhausted, to sleep. The answer was a quick and quashing dismissal. “No!” she laughed. “I was thinking now I could go work out without feeling guilty. And get some things done for the weekend, since I won’t have a chance while we’re gone.” She looked, dare I say, pleased with the situation. So I had not done her a bad turn. If anything, I might have given her a breather from her houseguest. As I’d hoped. Sometimes I wonder if selfishness is in the eye of the beholder. 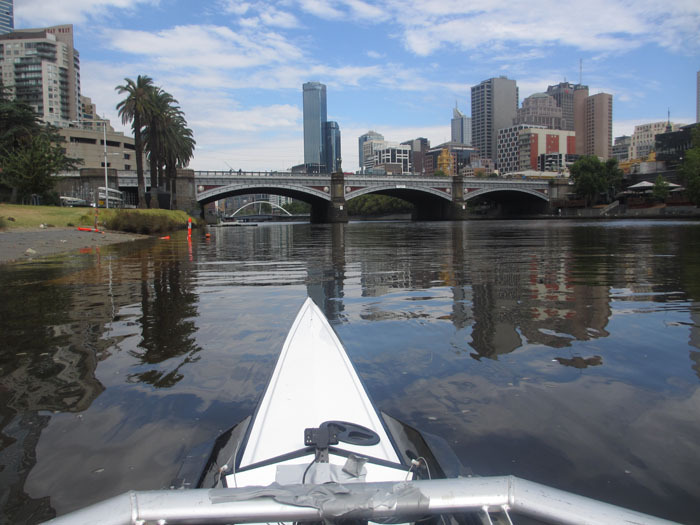 This entry was posted in Rowing, Travel - Beyond Berlin and tagged Melbourne, rowers, Rowing, selfishness, socializing on February 4, 2014 by Jill M.. It must be so peaceful out there on the water. I envy you that serene experience (when you’re not dodging trash traps or wakes, that is!). Well, there are a few lakes nearby….and one of them rents boats. There’s one particular lake I’d like to explore, but the only boats are the foot-pedal type. Still, it would be fun when I can find a friend to go with me.